When it comes to dresses, I typically don’t discriminate. This girl loves them all! From shift to fit-and-flare, there’s always room in my closet for another one. (Although my wallet may disagree….) But when it comes down to timeless, there’s just something about the wrap-dress that will forever be my favorite. Perhaps it’s the universally-flattering quality of the wrap-dress cut, accentuating the very smallest part of your waist, or the romantic feel of the dipped neckline. Whatever it is, the wrap is one style that’s managed to stand the test of time and prevail across trends and time periods! So, finding it in the prettiest shade of cherry red seemed like the perfect way to carry it forward into 2017. A final note on the versatility of this dress in particular. While I have it styled with summer wedges and a clutch for more of an evening look, this would be darling dressed down with sandals, a cross body and a hat for exploring a new destination! Somewhere in Europe when the weather warms up, perhaps? Is it clear I have the travel bug yet again?! How was everyone’s weekend? Mine was a blast, y’all, and I am completely exhausted… in the best way! It was “DTown” weekend for the group of 7th grade girls I co-lead a bible study for, which is basically a weekend-long, in-Dallas retreat! We had 48+ hours of dance parties, candy, incredible messages and heart to hearts, more dance parties, late bedtimes and more. I love these girls so much, and being with them is always the biggest blessing! It seriously felt like I’m in middle school again with all of the craziness going on this weekend – such a fun break from reality. (What is adulting?) Not complaining about this Monday, though, as the cowboy is in town (!!!) and we have a whole lot of fun planned! First up, Soulcycle! Love your dress Kate! Your weekend sounds like so much fun and quite the blessing. Have fun this week with the cowboy! I love the boldness of the dress. 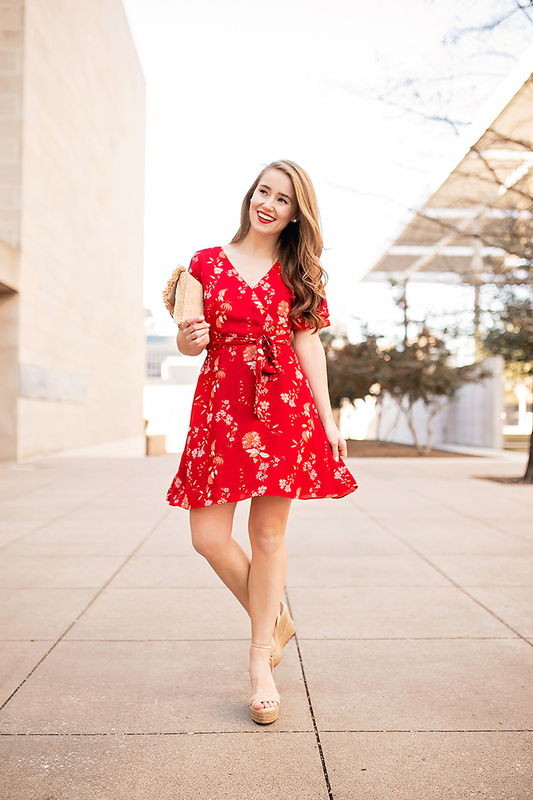 This dress is so GORG on you! So beautiful! 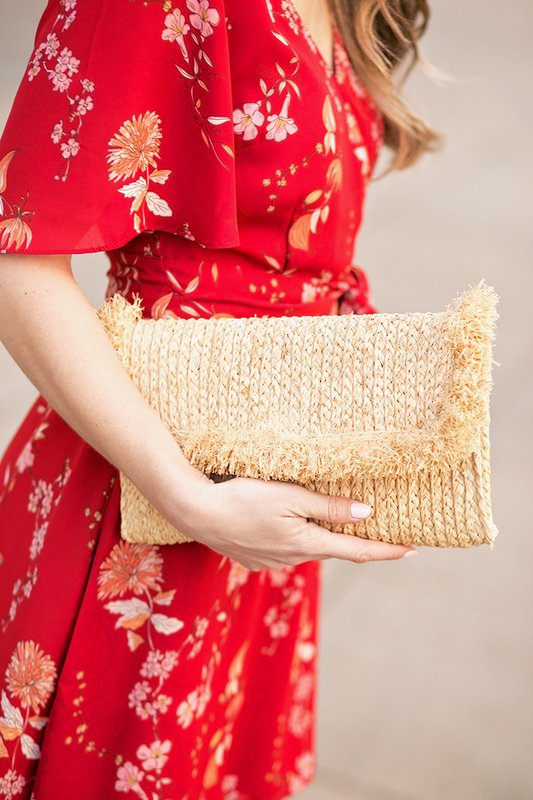 I love it paired with the straw clutch. Oh my gosh girl! That dress is drop dead gorgeous! I love it with those wedges and that clutch! I love love love the dress. So jealous that you can already wear your Summer clothes. Love this dress, you look gorgeous! Also love those wedges! It sounds like you had an amazing weekend girl! You are gorgeous in red! Love this look! This dress is so cute on you, Kate! Love those wedges too!